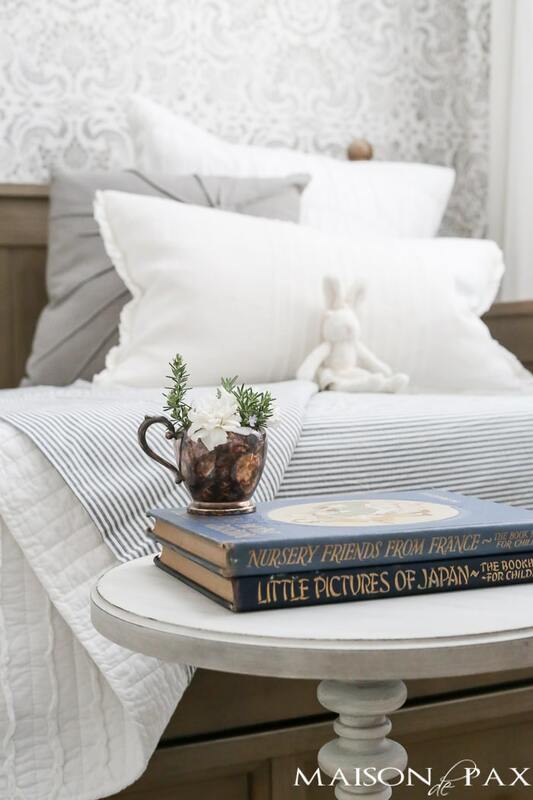 A gray-washed trundle bed provides the perfect anchor for a gorgeous, rustic, feminine, neutral little girl’s room. This post is sponsored by hayneedle. All opinions are my own. I can’t believe my daughter turned two this summer. 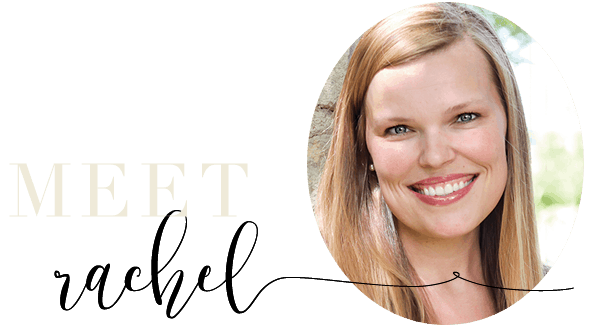 It’s not as if it was a surprise (we did, after all, know when it was coming)… but it still came as a bit of a shock to me. We packed away the crib (it’s the first time in six years that we haven’t had one in our home), and set up her room so that it can grow with her. When we moved into this home last summer, I knew I would have to rethink her room. I had originally been planning to give her the full-sized bed from our attic guest room at our last house, but her bedroom is only ~10’x11′, and I wanted her to have some floor space to play. As a result, I began hunting for a twin sized trundle bed. It seemed the best option: more floor space but still room to sleep two if needed. And then I found this gray-washed wood daybed at hayneedle, and I was smitten. 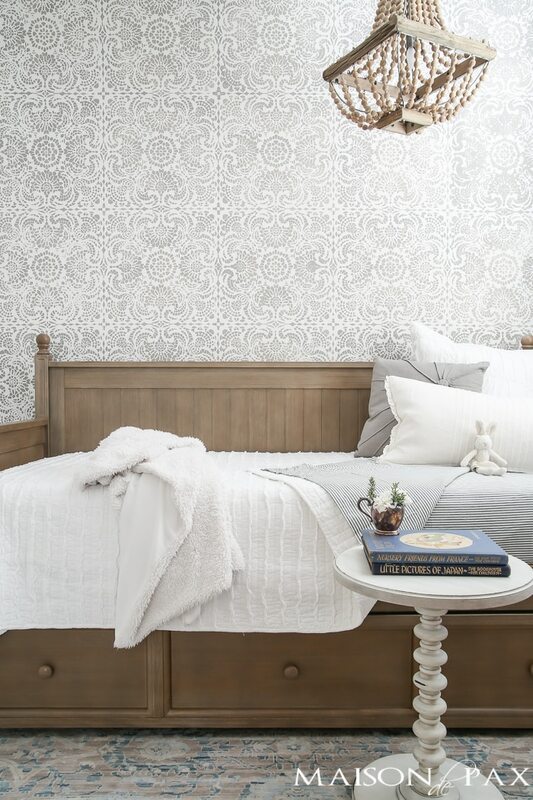 The wood is warm enough to give a cozy feel to the space, but the gray wash is soft and subtle. I love the planked look to the back and the clean look of the trundle drawer. 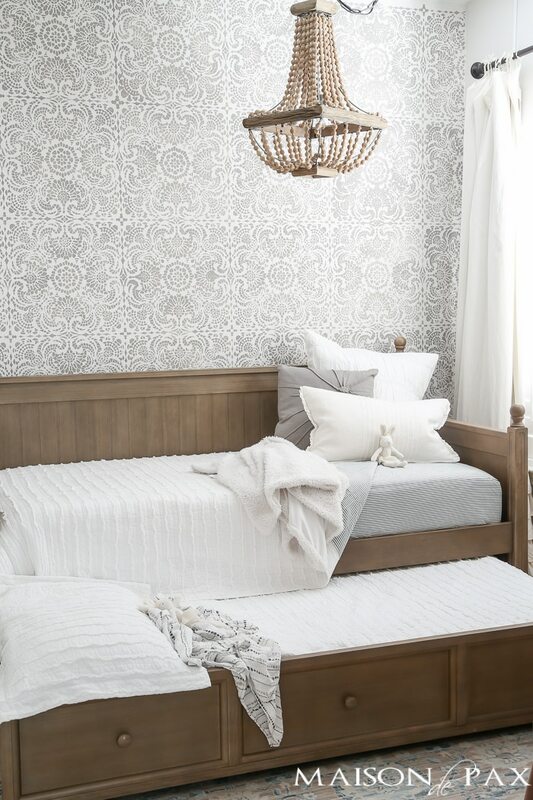 You already saw the chandelier I hung in there, and I think the combo of the wood bead and wood bed offers just enough rustic quality to an otherwise very girly room. 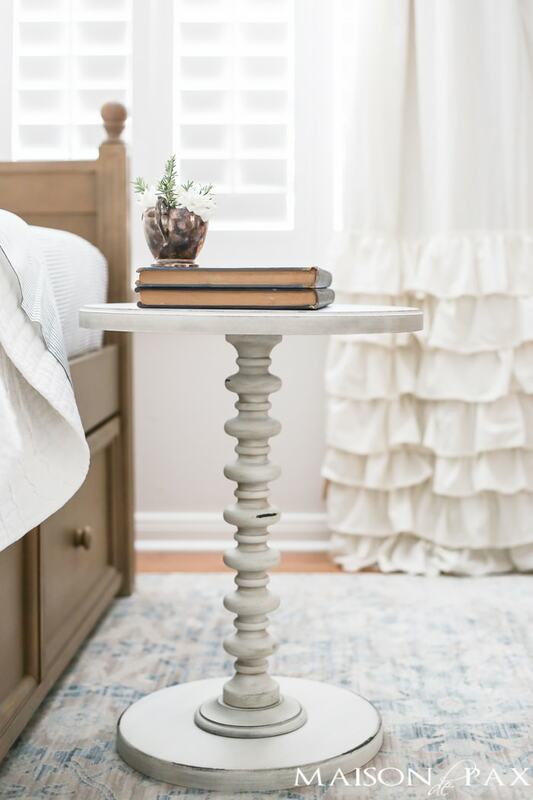 And since the daybed fits perfectly on the stencil wall – without much room for a normal bedside table – I loved adding this little portable side table to the room. 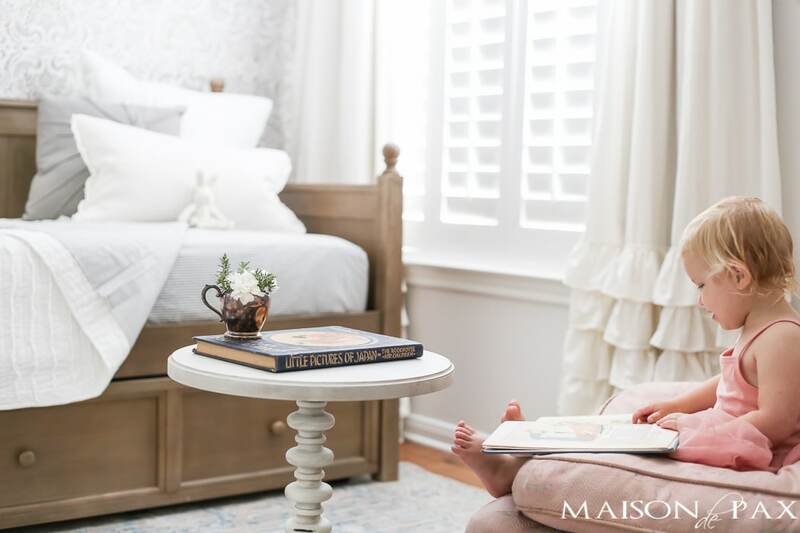 My daughter keeps her books on her little table… and we can put it by the bed or next to the chaise (a hand-me-down from my grandmother), depending on our preferred reading location that day. The vintage children’s books belonged to my grandmother, too, and while I don’t actually leave them within reach of my two year old normally, I do actually read them to my children. The rug is a new piece, too. I wanted something mostly white and gray, but I love that it brought some blues into the space, too. 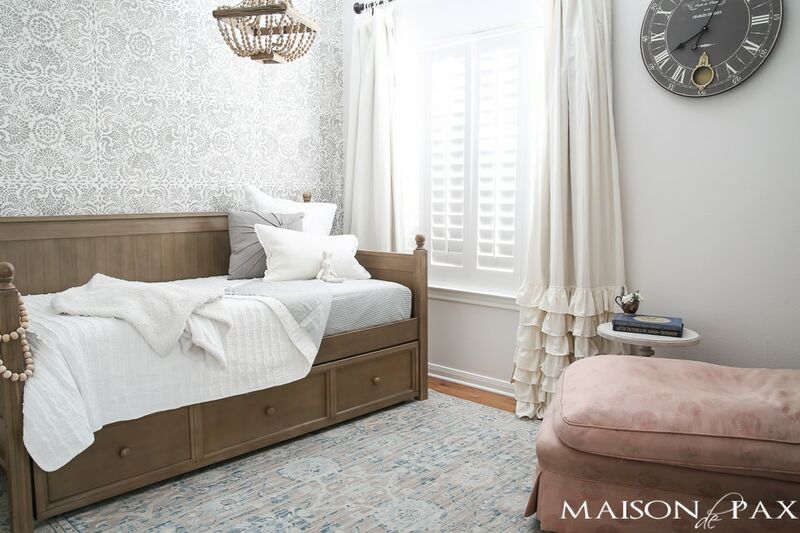 I think it’s a very grown up rug (which – in case you couldn’t tell – I like, even in a little girl’s room)… So it could work in a living or dining room someday if we decide to change up her space. 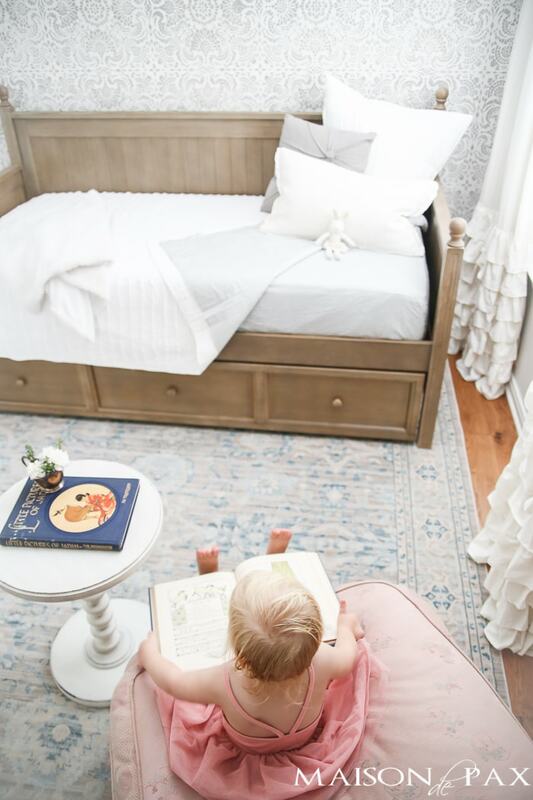 I kept the curtains from her nursery in the last house (diy tutorial here – I think you’ll be surprised by how little sewing skill is needed!). I prefer curtains that go all the way to the ceiling (the ceilings in our last house were lower than these), but I wasn’t quite ready to get rid of these anyway. And since I converted them to blackout curtains (tutorial here for that step), they are super practical, as well. I didn’t catch a picture (because I’m not fully decided on what to do with that side of the room! ), but you can just see the corner of her same gray farmhouse dresser (tutorial for that one here) which actually happened to come from my grandmother on the other side of the family. 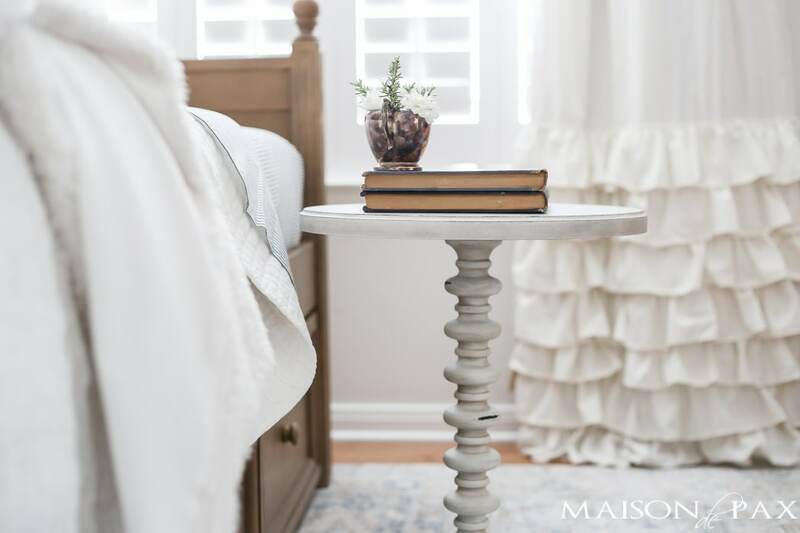 I love mixing family pieces and fun, new finds in my home. I know we don’t need beautiful spaces to have joy in our lives, but I think it makes me all the more thankful for this one: a sweet – if unnecessary – gift and a special place to enjoy one of the most precious things in life… family. 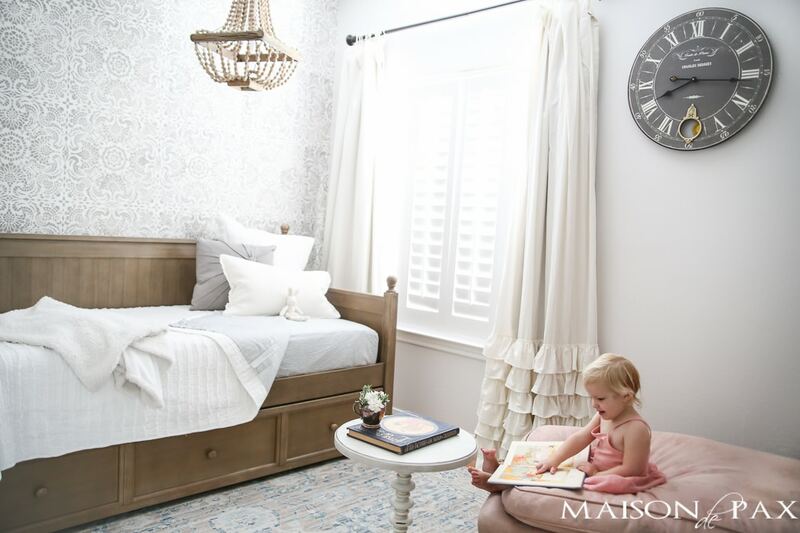 *thank you so much to hayneedle for providing the pieces to update my daughter’s room! What a pretty room. 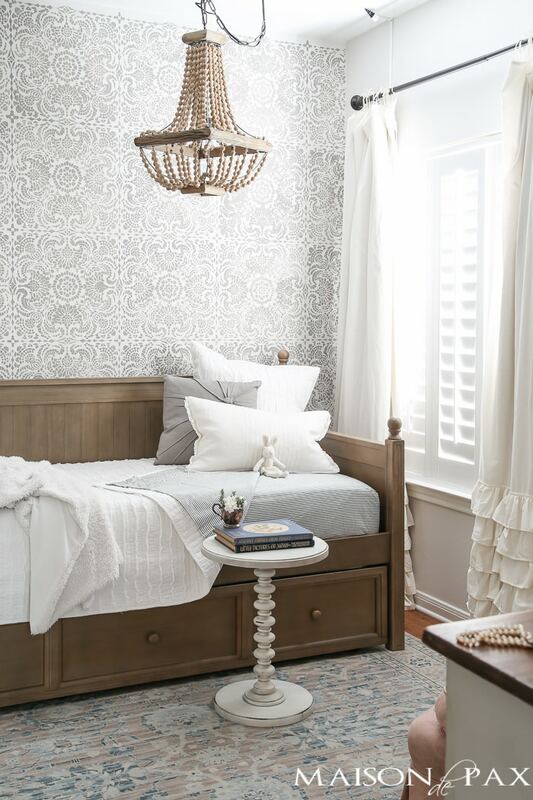 I love that it doesn’t ‘scream’…so tastefully done, and ‘rustic feminine is the perfect description.